Eric Decker, WR New York Jets (5 Years/$36.25 Million)- My Jets snagged Decker from the Broncos for a very reaosnable price. By no means has he proven to be a sure #1 receiver, but he has that kind of upside. At the very least, he's a very good second option, and a receiver that would help any roster in the league. Especially my Jets, whose other pass catchers include Stephen "Stone Hands" Hill, Jeremy Kerley, who is a decent slot guy at best, David Nelson, and Greg Salas (who?). Gang Green will probably go after Marqise Lee or Odell Beckham, Jr. in the draft, giving them two real offensive weapons, which is something that they truly lacked last year. AHJBJJWR Scale: 0.5 out of 5. This contract will not fail as badly as Decker above. Michael Vick, QB New York Jets (1 Year/$5 Million)- In an almost comical turn of events, the Jets announced via Twitter at 6:22 PM yesterday that they had released Jets legend, quarterback Mark Sanchez. At 6:27 PM, this was posted to their official Facebook page. I saw it within seconds and was immediately filled with glee. Then, in what seemed to be an effort to completely troll the world, literally five minutes later, at 6:32 PM, this appears on my news feed. I must congratulate the Jets and their Public Relations staff for making those five minutes a lot more interesting than they would have been otherwise. As for what happening on the field, I don't hate this deal at all. If Vick plays even twelve games (which is wishful thinking) he will certainly help the team towards the playoffs. My issue is how this will affect Geno Smith. I don't know how much he's going to develop as the backup to Vick. People are going to say that Vick is going to play the mentor role, but frankly I don't see how that would work. Vick's strengths were unique to him and his athleticism. I'm not sure if he's going to be the greatest teacher in the world. If I'm wrong, this signing may be the greatest thing to happen to this organization since when they released Mark Sanchez. Even if I'm right, Geno will toil on the bench, come in whenever Vick gets hurt, and use that opportunity to prove to the team that he's the guy. Also, there is a minimal amount of money involved in this contract, so I don't have any issue with it. This is a great move. It's official! Photo from vibe.com. AHJBJJWR Scale: 1 out of 5. Worst case scenario, Vick plays most of the year, Geno regresses, and they have to trade up in the draft for a quarterback next year. Darrelle Revis, CB New England Patriots (2 Years/$32 Million)- Now onto the deal that has caused an uproar in New York. Revis, a former Jets legend has joined the enemy, causing many Jets fans to behave in a rather vile manner, insulting and wishing harm upon Revis. Look, I personally have no issues with his decision. He held the Jets up for cash, and we made the right decision and moved on from him last year. This time around, he was a free agent, and it was his choice to go to New England. He has no obligation to make the Jets or their fans happy. He did what's best for himself and his family, and there's no reason to react by burning his jersey. Come on people, you're better than that...I hope. As for the actual move. This was probably a panic reaction to the news that Talib had left to go to the Broncos. But it will pay off, as Revis was still very good while rehabbing a knee injury last year. Look for him to be back in top form in 2014, sectioning off half of Gillette Stadium as Revis Island. This is certainly a ton of money, but it's worth it. Photo from nypost.com, and the minds of many irrational Jets fans. AHJBJJWR Scale: 0.5 out of 5. As with any large contract, this will only go south if he gets, not because he's injury prone, but because of the amount of money this would cost the team. Jairus Byrd, FS New Orleans Saints (6 Years/$56 Million)- This is a lot of money. I mean, a lot of money. Byrd is very good, was the best safety on the market, but not so much better than T.J. Ward that he deserved two more years and $33 million more. Clearly safety is an area of concern for the Saints who still had to deal with Roman Harper, his gray hair, and his comically bad play over the last couple of years. But, they severely overpaid here. Pairing with him Kenny Vaccaro will make it quite difficult to throw on the Saints, so on the field, this deal will work out perfectly. But New Orleans paid a premium. AHJBJJWR Scale: 2.5 out of 5. Hakeem Nicks, WR Indianapolis Colts (1 Year/$3.5 Million)- I love this deal so much. 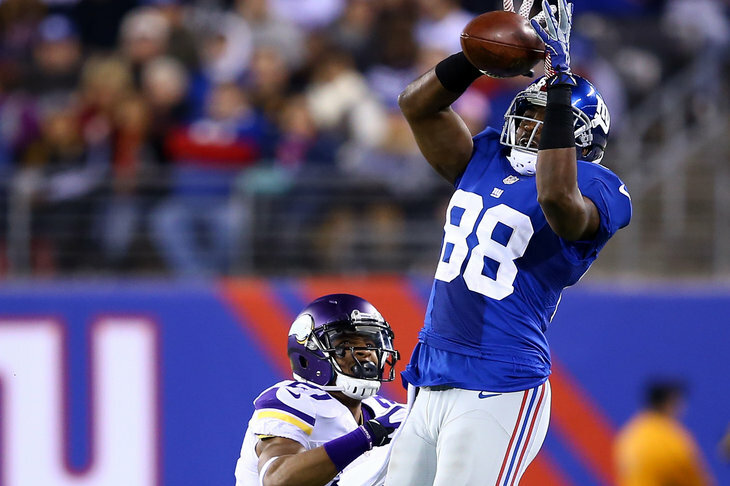 Personally, I think that Hakeem Nicks is done. Too many knee problems have slowed him down to the point where he was completely worthless last year. That partially may have been the fault of his worthless quarterback, but he wasn't doing himself any favors. Yet, he still has the potential to show why he was so highly touted coming out of college. A great athlete, he may reach back into the well and pull out a solid, inexpensive year for the Colts. Even if he plays like he did last year, this contract is so small that it doesn't matter. This is a great move by Indy to take a flyer on a potential stud. I used to think he was great, but he needs to prove himself worthy of that status. This is a great opportunity for him to do so. Photo from catscratchreader.com, and from Nicks' past life as a good football player. AHJBJJWR Scale: 0 out of 5. Darren Sproles, RB Philadelphia Eagles (Traded for a 5th Round Pick)- There's just not enough about this trade to love for the Eagles. I don't think we have a way to describe the ways in which Chip Kelly will utilize this great new weapon. This is adds a whole new dimension to an already dynamite offensive attack which is already getting back Jeremy Maclin, who missed all of last season with an injury. Along with Lesean McCoy, Sproles ia now part of one of the best running back tandems in the game. Expect Sproles to be a gigantic factor of the backfield this year. Perfect situation for him to fall into. AHJBJJWR Scale: -3 out of 5. Julius Peppers, DE Green Bay Packers (3 Years/$30 Million)- He's probably more washed up than Ware is, so I don't really know how much he can contribute to this team. And there's a lot of money involved in this contract. If he's productive, and Clay Matthews stays on the field, along with Nick Perry the PAckers will have a great group of pass rushers. But those are two huge variables. 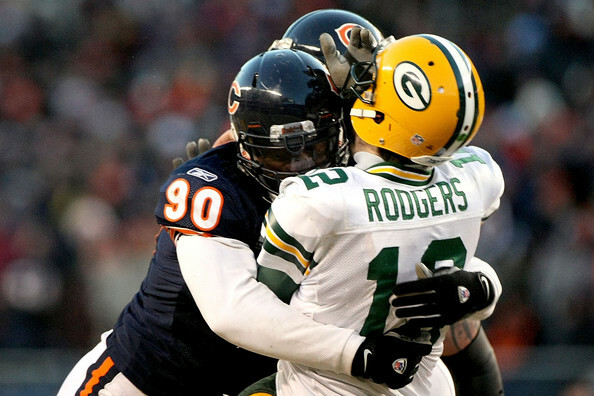 Even if he turns out to be washed up, at least Aaron Rodgers is glad Peppers won't be doing this to him. If Peppers hits him like this in practice, Head Coach Mike McCarthy might place a bounty on him. Too soon? Photo from zimbio.com. AHJBJJWR Scale: 4 out of 5. Jared Allen, DE Chicago Bears (4 Years/$32 Million)- For a Bears team that lost Julius Peppers this offseason, Allen is actually an upgrade as a pass rusher. Not only is Allen two years younger, he has been more productive over the last few seasons. And his contract is worth less than that of Peppers per year. Overall, this is a massive win for Chicago to get rid of Peppers and replace him with Jared Allen. Considering the market for pass rushers set by Peppers and Ware, this is a steal. AHJBJJWR Scale: 2 out of 5. He'll be just as GIF-able in Chicago. Steve Smith, WR Baltimore Ravens (3 Years/$12 Million)- I don't think Smith has the ability to carry an offense as he was asked to do in Carolina. However, I like him very much as third option behind Torrey Smith and Dennis Pitta in Baltimore. He won't put up gaudy numbers by any means, but he will add a dimension to the offense that the Ravens truly lacked last year when they relied on Tandon Doss to be a legitimate NFL receiver (he's not). Both Smiths, Pitta, and Jacoby Jones give Baltimore a pretty nice core of weapons. The length of the deal is a bit much, but he'll at least contribute this year, and we'll see where it goes from there. Even if he's bad, the contract is very inexpensive. AHJBJJWR Scale: 1.5 out of 5.